Being a music fan on the Central Coast, you need to be somewhat creative (and mobile) if you want to see some of the top acts on the concert circuit. So when the venerable Bonnie Raitt ventured out for a short West Coast tour last week, including a stop at the Tachi Palace Casino, I jumped at the chance. A friend once told me: Try to meet someone new and do something different every day. So my 105-mile trek via Highways 101, 46 and 41 to just south of Lemoore took care of that. It’s a pretty easy, less than 2-hour drive that ends with an impressive Vegas-type complex rising from the vast valley floor. While not booking the quantity of shows the Chumash does, Tachi Palace is bringing in more entertainment every year. Last year saw country mainstay Martina McBride and classic rock vocalist Paul Rodgers. Next month, veteran crooner Glen Campbell plays the casino. And unlike the Chumash, patrons can enjoy an adult beverage during the show and take in the warm valley nights at their outdoor venue during the summer. However, it was the folk/blues slide guitarist and singer extraordinaire who got 2011 off to a bang with her short but strong 90-minute set at a converted third floor bingo hall. It’s not every day you see a Rock ‘n Roll Hall of Famer play such a gig. But the 2/3-capacity, mostly older, female audience were very glad she did. Dressed in boots, jeans and a shirt that matched her wavy red hair and backed by a tight 4-piece band, Raitt smoothly moved from old standards and covers to hits from her back-to-back-to-back multi-platinum early 90’s releases. As she pointed out on more than one occasion, life really begins at 40. My girlfriend really hopes she’s right. 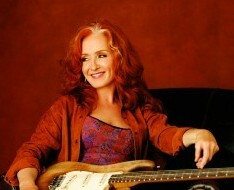 Like Willie Nelson, I was surprised that Raitt wrote only a few of her biggest songs. But it was those many hits: ‘Good Man, Good Woman’, ‘Have a Heart, ‘Nick of Time’, ‘Love Letter’, ‘Something to Talk About’, ‘Love Sneaking Up On You’ and ‘Real Man’ were the centerpiece of the evening. As it turns out, the only one missing was my favorite: ‘Thing Called Love’. You remember that fine ditty written by John Hiatt and made famous by her video with Dennis Quaid. Oh well, maybe next time. Raitt, keyboardist/vocalist Ricky Peterson and guitarist George Marinelli really stood out on on several blues covers, the haunting John Prine ballad ‘Angel from Montgomery’ and the equally soulful “I Can’t Make You Love Me’. Think about it, she’s a true pioneer — playing smoky clubs for years as a slide/lead guitarist and vocalist in the macho music world long before any female peers, including Heart’s Nancy Wilson and the Pretenders Chrissie Hynde. And she’s one of those rare musicians whose guitar sound and voice are distinctive and instantly recognizable. While not as energetic as her younger, slicker counterparts, Raitt showed an ease, style and skill that can only come from being a rock and roll survivor and success story. Sometimes however, that comfort comes at the expense of spontaneity and unpredictability. A few brave fans finally moved up front at the end of the show, imploring the appreciative but mostly sedate crowd to get off their collective feet. But there were only a few takers. Rock and roll is definitely a youthful sport but that doesn’t mean us older folks can’t knock it out on occasion. After all, isn’t that what keeps us young? The now 61-year old affable, accomplished, performer is living proof of that.